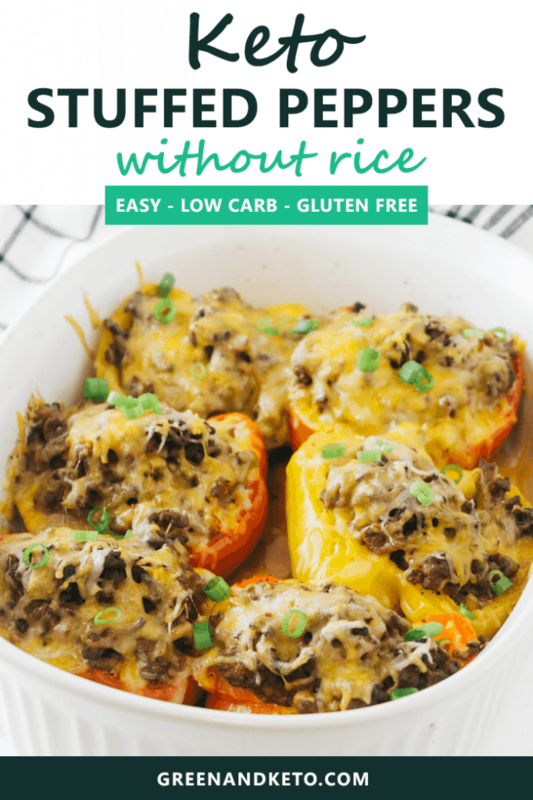 These Keto Stuffed Peppers are so tasty, you won’t miss the rice one bit. The ground beef and veggie filling is cooked up on the stovetop, and then stuffed into bell peppers. The bell peppers steam and soften in the oven – totally hands off. This is one of those keto casserole dishes that are perfect for meal prep and batch cooking, too. 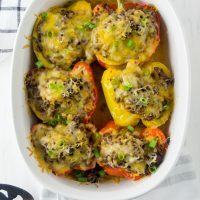 These low carb stuffed peppers can be prepped ahead of time and refrigerated until ready to cook. Or, you can prepare the dish all the way through, and refrigerate the leftovers to serve the next day. This 9-ingredient keto dinner recipe starts off with sweet bell peppers. Green, red, yellow, or orange — it’s your choice! But, if you are watching your carb count extra carefully, you should know that the red peppers have 1 gram more carbs per cup than the green peppers. 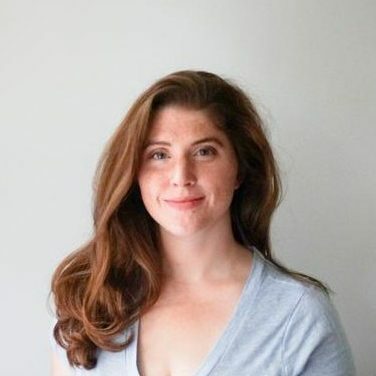 It’s not enough to make a big difference — but I thought I’d point that out! In any color, bell peppers are good sources of vitamins A and C, potassium, folic acid, and fiber. One half red bell pepper has about 2.5 net carbs. Ground Beef. I used 80% lean in this recipe. You could use whatever blend you like. I think it would also be delicious with a mixture of beef and Italian sausage — yum! Zucchini. Since we aren’t using rice in this recipe, I add grated zucchini for moisture, flavor, and fiber. Tomatoes. I used plain, crushed, San Marzano tomatoes. You can use your favorite tomato sauce instead — a lot of people recommend Rao’s brand — just make sure to check the carb count. Cheese. A mix of shredded cheddar and mozzarella worked really well in this recipe. To start, cut each of your bell peppers in half, and clean out the seeds and membranes. Season the inside of each pepper half with salt and pepper. Place the halved bell peppers in a greased baking dish in one layer. Set the dish aside while you make the filling. Heat olive oil in a large pan over medium heat. Cook the ground beef until browned. Add the vegetables and seasonings and cook until they are soft and translucent. Stuff the peppers with the ground beef mixture. Do your best to evenly divide the mixture among the peppers. Carefully pour 1/2 cup of water between the peppers into the baking dish and cover with foil. The water and the foil will create steam in the oven, which will soften the bell peppers as they cook. Bake until the peppers are tender and the filling is heated through — about 45 minutes. Remove the foil and sprinkle the peppers with shredded cheese. Return to the oven until the cheese is melted — about 5 more minutes. And you’re done! This would make the perfect entrée when served with something like keto cauliflower rice. Need something green on the side? Try out roasted broccoli. 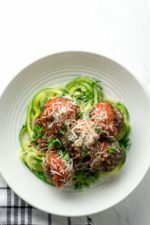 If you like these keto comfort food dishes, be sure to check out our other keto dinner recipes. 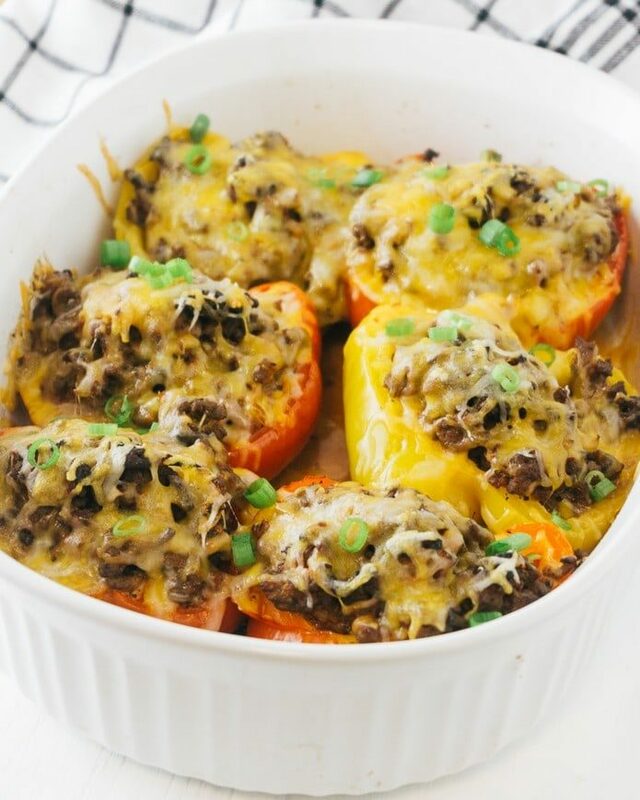 This Keto Stuffed Pepper recipe is an easy, delicious dinner that your whole family will love. Made without rice to make it keto-friendly and low carb. Preheat the oven to 350 and spray a baking dish with cooking spray. Prepare the peppers and the filling. Use a knife to cut each bell pepper stem in half. Remove the ribs and the seeds. Season the inside of each pepper with salt and pepper. Place the peppers into the greased baking dish in one layer. Set aside. Cook the filling. Heat the olive oil in a large frying pan over medium heat. Add the ground beef, season with salt and pepper, and cook, stirring occasionally, until browned. Add the onions, zucchini, garlic, and oregano, and cook until softened. Stir in the crushed tomatoes. Taste and season with salt and pepper as needed. Remove from heat. Stuff the peppers. Evenly divide the mixture among the peppers. Carefully pour 1/2 cup of water between the peppers into the baking dish. Cover with foil. Bake until the peppers are tender and the filling is heated through -- about 45 minutes. Remove the foil and sprinkle the peppers with shredded cheese. Return to the oven until the cheese is melted -- about 5 more minutes. Remove from the oven and garnish with scallions and herbs, if desired, before serving. Recipe Notes Make ahead: The peppers can be stuffed and refrigerated up to 1 day ahead. Add 10 minutes baking time. Storage: Leftovers can be stored in an airtight container in the refrigerator for up to 4 days. 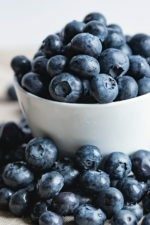 Thanks for your comment — we are definitely working on adding more nutritional info to the site. With the ingredients we used, each half pepper was 280 cals, 19 fat, and 6 net carbs. 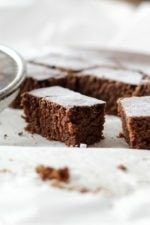 If you go to https://www.myfitnesspal.com/recipe_parser you can input your specific ingredients to get the exact amounts. Any tips for making these to freeze? At which step would I freeze? I haven’t tried freezing these myself, but I bet you could! Most “traditional” stuffed pepper recipes recommend freezing after filling, but before baking. I also would recommend leaving off the cheese until you are ready to bake.